One in three U.S. consumers would consider a mortgage from retailer Walmart and almost half would consider one from online payment provider PayPal, according to a financial services study released on Monday. The results might be especially disconcerting for banks because the two companies don't even offer mortgages. The study shows that consumers are willing to try alternative lenders as borrowers focus on price, customer service and trust in their provider when selecting a mortgage, said Doug Hautop, lending practice lead at the Carlisle & Gallagher Consulting Group, which conducted the survey. "There is a real threat from new entrants," Hautop said. The study's results were based on online responses from 618 U.S. consumers in September. Non-bank mortgage companies such as Quicken Loans and Nationstar Mortgage Holdings Inc. have been gaining market share as some large banks, such as Bank of America Corp., pull back in a business that burned them during the financial crisis. Carlisle & Gallagher, based in Charlotte, N.C., provides consulting services to five of the top eight U.S. mortgage originators, Hautop said. 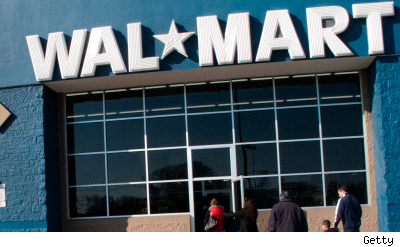 A Walmart Stores Inc. spokeswoman declined to comment on the survey. The retailer provides small business loans at its Sam's Club stores, but doesn't offer mortgages. A spokesman for PayPal Inc., a subsidiary of online auction site eBay Inc., said it offers credit lines for customer purchases, but hasn't announced plans to move into the mortgage business. It's not unheard of, though, for retailers to enter the mortgage business. In late 2011, warehouse retailer Costco Wholesale Corp. began offering home loans online through select lenders. The company doesn't disclose loan volume, but the service has gone well, said Jay Smith, Costco's director of financial services. "We have tried to make it a service where members see significant value on rates and fees," Smith said. While the Carlisle & Gallagher survey found that 80 percent of U.S. consumers would consider a mortgage from a non-bank, there was a bright spot for traditional banks. Seventy percent of respondents said that they would prefer to have their mortgage with one of their main banks, although only 39 percent currently do so. This beautiful condo has sweeping, open spaces -- so much so that you'll feel like you're living in your own detached single-family home! The homeowners association fees have been reduced, according to the listing, and the home juts up against the vast greenery of Forest Park. And not to forget location, location, location: It's only 10 minutes to the downtown area. Don't live in Portland? Find homes for sale and for rent in your area. Look how much house you can get in Dallas for $4,000 less than the national median home sales price! You're getting almost double the square footage as in the Portland home. This spacious pad has been updated, the listing says, and includes a tiled kitchen, large backyard and spacious patio. Don't live in Dallas? Find homes for sale and for rent in your area. It "starts with the curb appeal on this professionally landscaped corner lot," the listing says. There's a finished basement with an extra bedroom and bathroom if you need more living space. The home has a huge backyard with two patios, a storage shed and a privacy fence. Inside, there's an open, flowing floor plan. Don't live in Louisville? Find homes for sale and for rent in your area. Hey, it's New York. While prices around the national median home price might buy you some pretty significant homes in a lot of cities around the country, that can't necessarily be said for the Big Apple. But still, this co-op apartment is a pretty good deal for what's available at this price point in Manhattan. It has a decent size with open rooms, and it's in an elevator building -- something not to be taken for granted in New York City! The living room has been converted to include a smaller room that can be used as a third bedroom or office. Don't live in New York? Find homes for sale and for rent in your area. Detroit was one of the cities hardest hit by the housing bust, and prices have taken an alarmingly steep dive. Of course, that's not a bad thing for homebuyers. For the national median home price, you can practically buy a mansion in Detroit. This spacious brick Tudor is "move-in ready," according to the listing. The three-floor home has a living room with fireplace and a library with built-ins. There's a finished rec room with a wet bar, a "dance area" and laundry facilities. There is one little catch: Some of the interiors may need updating. Don't live in Detroit? Find homes for sale and for rent in your area. Recently refurbished, this single-family home has a kitchen with gorgeous granite countertops, an updated bathroom and a large lot with front and rear access to parking. There's also a partially covered garage. Don't live in Los Angeles? Find homes for sale and for rent in your area. With a separate living and dining room and a den/office, this home is perfect for a first-time buyer, the listing says. The roof is fairly new, and the backyard is completely fenced in for ultimate privacy. Don't live in Tampa? Find homes for sale and for rent in your area. A "perfect starter home," the listing says, this house has an open floor plan, a main-floor office and a large kitchen. The home is owned by the U.S. Department of Housing and Urban Development, so the buyer must take it as-is. Don't live in Commerce City? Find homes for sale and for rent in your area. Two-thirds of respondents said the high cost of getting a loan was the most painful aspect of the mortgage application process, followed by slow execution (56 percent) and poor communication with the lender (32 percent). "Banks have a captive audience, and have folks who are willing and wanting to do business with them," Hautop said. "It means it's time to go back to the basics for our banks." In the past year, banks, including Wells Fargo & Co and JPMorgan Chase & Co, have benefited from surging consumer demand to refinance their mortgages at low interest rates. But in the coming year, refinancings are forecast to decline, so banks will need to focus more on serving customers taking out loans to purchase homes, Hautop said.